For those of you quilters who get in comforters (quilts that are already sandwiched) or if you want to put a border around a quilt, here is an idea for you. 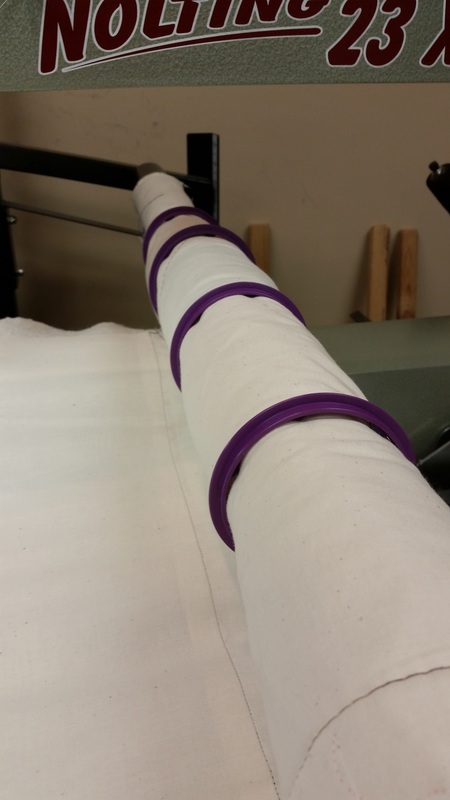 Pin your quilt of comforter to the #1 roller (the one under the neck of the machine). Then feed the other end of the comforter between the #2 and #3 roller and let drop to the floor. Place the JAWS on the #3 (see picture). Lock down your gears and tighten your quilt or comforter. After you have quilted this area, remove JAWS and turn the quilt. They can also be used when making repairs on quilts. Instructions do come with set.